One of the most common causes of injury in modern care homes is falls from bed, so everything possible should be done to prevent this from happening. The Bradshaw Low Nursing Home Care Bed is designed with this in mind, and features a mattress platform that can be lowered to just 19cm off the ground, and is available with side rails to prevent falls. 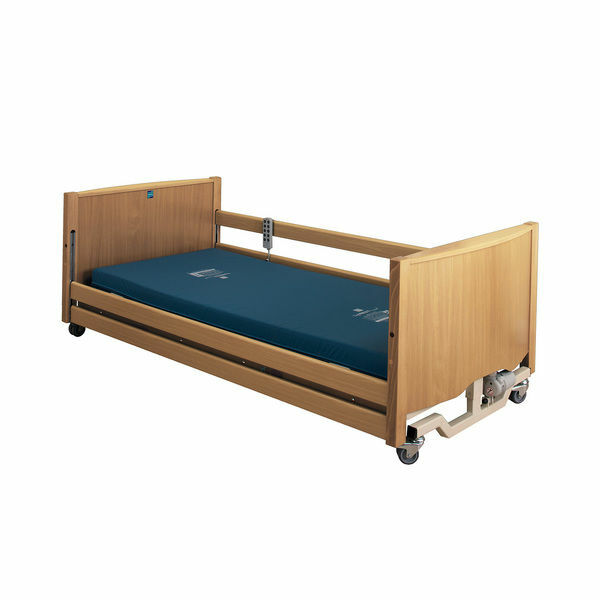 Equipped with four-section electric profiling capability with a choice of wood colour to create a comfortable patient environment, this low bed is an ideal option for care homes and nursing care environments. The low platform of just 19cm off the ground makes this bed an excellent choice to reduce injury risk in patients that prone to falls from bed. When combined with side rails and a crash mattress, this bed can be an integral part of a full fall safety system. To provide as many positioning options as possible, this bed features four-section profiling. It is adjustable at the backrest, knee break and legrest, and features a range of height adjustment from 19cm to 61.5cm. To facilitate fluid-draining procedures, the bed also has Trendelenburg and reverse-Trendelenburg capability. Please be aware that delivery of the Sidhil Bradshaw Low Nursing Home Care Profiling Bed depends on the model that you are purchasing. For the Light Oak finish, delivery can be expected approximately 1 week after placing your order; for the other finishes, it may take between 3 and 4 weeks to receive your product. We apologise for any inconvenience that this might cause you and advise that you factor in delivery times prior to placing your order. For more information, please contact our Customer Care Team at 020 7501 0592.